We produce for Italy and abroad linea malizia silicone spheres moulds for showpieces. 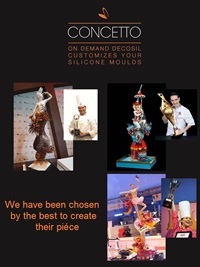 Italian leaders of silicone moulds, we create and sell for over 10 years linea malizia silicone spheres moulds for showpieces, food safe silicone moulds worldwide to confectioners, bakeries and Delicatessens. Among Linea Malizia moulds collection, conceived by the pastry chef Davide Malizia, you can find Spheres moulds of different diameters. The Sphere mould is composted of 2 silicone parts perfectly smooth. The lower part is made of black rigid silicone in order to support the weight, and the upper part with the hole for the silicone casting which is softer to facilitate the demoulding. You can use it indifferently with chocolate or sugar and it won't need a rigid support as it is self-supporting.